HC-DM3721 is a compact SDH device with STM-1 interface. It can connect with any standard STM-1 optical port, connect to the metro network directly and build point to point network. 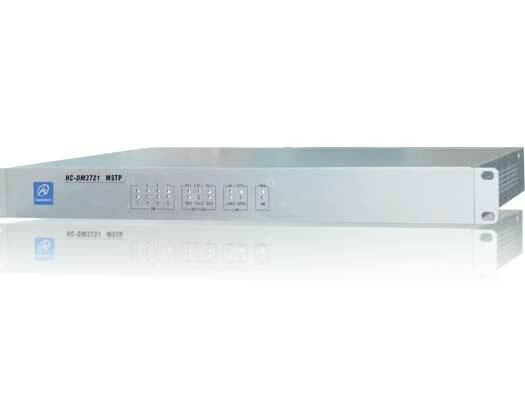 8×E1 lines, 2×100Base-T Ethernet service can be supplied. HC-DM3721 can work as terminal equipment in the point to point network. It is mainly used in access layer network to supply various services such as STM-1, Ethernet typical applications include big client access,3G mobile station connection and etc. Standard STM-1 optical ports, 1+1 protection supported, dual or single fiber WDM transmission, different wavelengths and powers can be selected. Standard SDH mapping of various service interfaces. Ethernet mapping adopts GFP/VC-12 virtual concatenated technology, Laps and PPP/HDLC protocol.